Thanks for stopping by on what I can only describe as the beginning of a very exciting month of celebrations for Winnie & Walter's third birthday! Woohoo! And, it all kicks off with a different birthday challenge set by each member of the DT. To me, patterns can be random and they can also be symmetrical. They can be calculated or they can simply be achieved by going with the flow - my most successful ones tend to be when I haven't thought too hard about them. 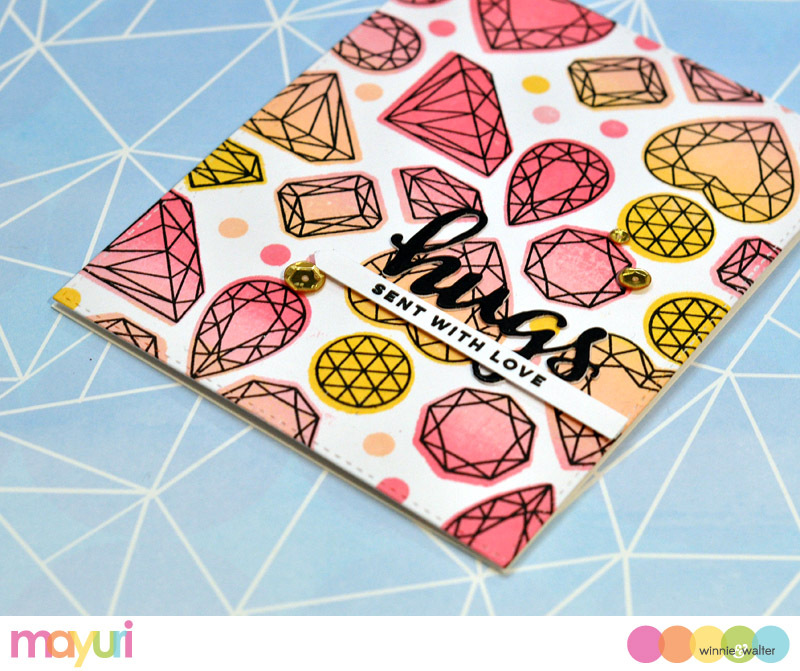 For this card, I first wanted to create each impression with the backs of the stamps. I laid out each of the gems images from My Precious onto the door of my MISTI, making sure the back was facing up. I wiped the stamps clean, flipped them over an remounted them so that they were the right way around on the door of the MISTI. I inked them up with black dye ink and stamped over the previous impression. This technique works well with symmetrical stamps, but you could try it with anything you have... I die-cut the panel down to the same size as my card base and adhered it straight down to the front. I die-cut the 'hugs' sentiment from some black cardstock using a die from The Big, the Bold and Friends Cutaways and adhered it to the card front. 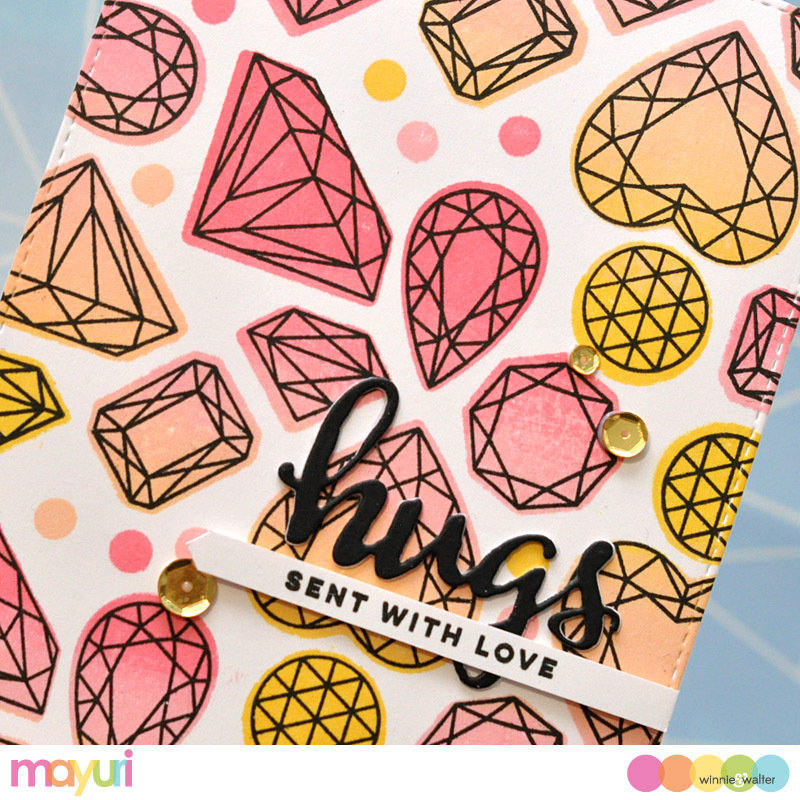 The second part of the sentiment comes from the new Sentimental: Love set and was stamped onto a strip of white cardstock and foam mounted below the 'hugs'. To finish up, I added some gold sequins! I hope you’ll play along with this challenge and all the other ones set by the rest of the DT – you’ll find more details over at the Winnie & Walter blog – you’ll need to use at least one Winnie & Walter product. Winners of each challenge will be chosen randomly by Winnie & Walter. I've been wanting to use both the fronts and the backs of my stamps for ages. Thanks for the incentive to do so, with your fabulous card. Love the ombre look. Wow!! What a cool technique. Would love to use the front and back of stamps too :) thanks for sharing!! Beautiful card!! Love the pattern you have created! Very beautiful! 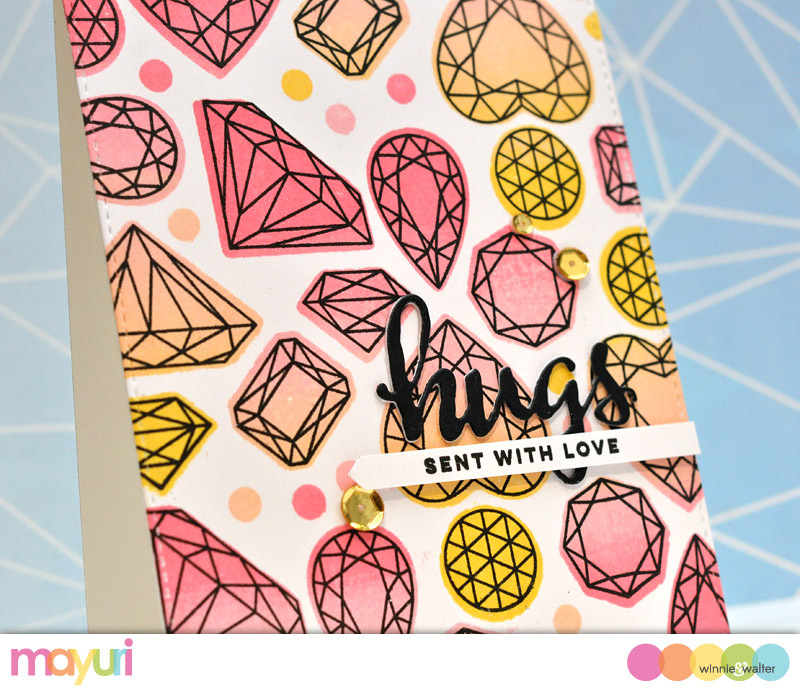 FABULOUS facets and BEAUTIFUL card! L O V E it ALL! 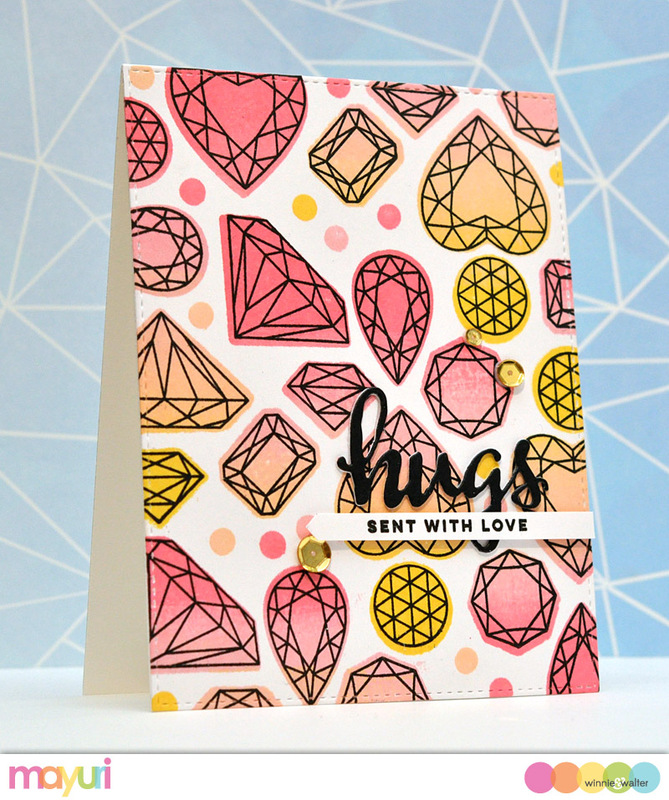 I love this card and pinned it on my board, You are a Gem! I love these bright and colorful jewels! LOVE your challenge, Mayuri! I've always intended to use the back of stamps this way & still haven't ever tried it, but now I will! Your card is beautiful & so fun! Stamping a patterned background is something I hardly EVER do...so this was a great challenge for me!! Thank you for sharing your gorgeous card and for this lovely challenge. I love this look you created! Wonderful challenge, thank you!